What an incredible experience - sixteen days in Dubai, visiting the American School and speaking with librarians, teachers, and hundreds of children. 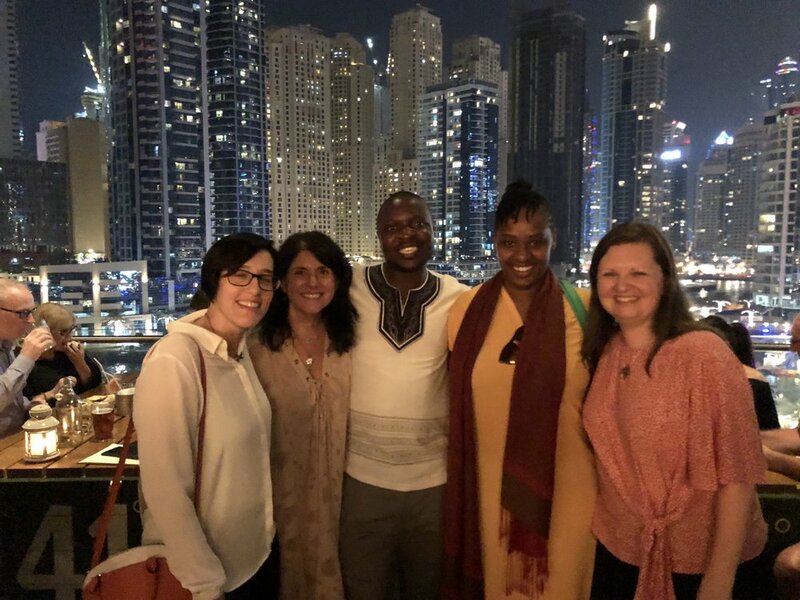 I was honored to spend time with the inspiring William Kamkwamba, and I am incredibly grateful to Natasha Pollock, Jason Roach, Julie Jones, Jennifer Baltes, Mara Ziemelis, and everyone at the American School for making my visit so memorable. Such an honor to be a judge of the Golden Kite award this year, along with Wendell Minor and LeUyen Pham. Congratulations to all of this year’s SCBWI winners! So inspiring to hear Sonia Sotomayor speak! BLUE has been selected as a Wall Street Journal Best Book of 2018! BLUE is a Horn Book Fanfare Best Book of 2018! Blue has been selected as an NPR Best Book of 2018! BLUE - A School Library Journal Best Book of 2018! BLUE has been selected as a School Library Journal Best Book of 2018! What a unique and utterly fun event! I was thrilled to see so many familiar faces and meet some new friends, too. And of course, what a treat to share the stage with the fabulous Susan Roth and John Parra. Much thanks to Cecilia Yung, Laurent Lynn, and Isabelle Warren Lynch for organizing an amazing event! 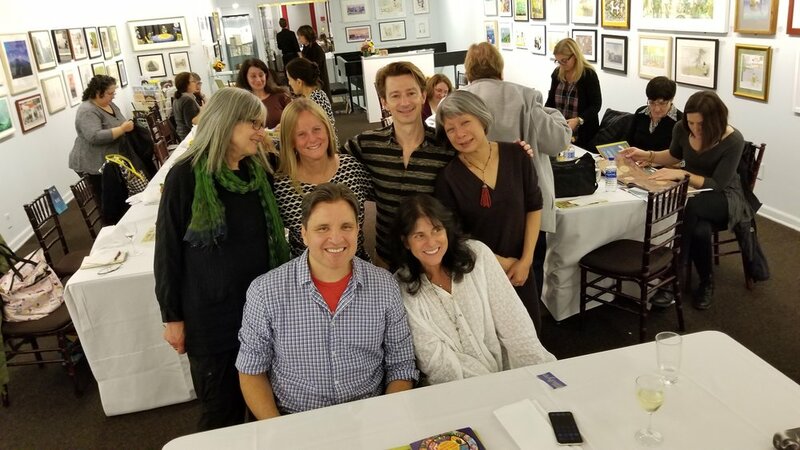 pictured: Susan Roth, Isabelle Warren Lynch, Laurent Linn, Cecilia Yung, John Parra, and me. If the state of the world or anything else is putting you in need of a good cry, I recommend Laura Vaccaro Seeger’s BLUE (Neal Porter/Roaring Brook, 32 pp., $17.99; ages 3 to 8). It’s another book that uses only two words on each page. This time the phrases all include the word blue — “chilly blue,” “true blue” — the better to show off Seeger’s thick, brushy art and die-cut holes, which are reminiscent of her Caldecott Honor-winning “Green.” Seeger walks you through the life span of a good dog belonging to a little boy who grows to be a man just as the dog passes into the great beyond. (It’s a tip of the hat, perhaps, to the folk song “Old Blue.”) The ending made both me and my husband cry. Our 8-year-old son seemed unmoved, but that may be because his first dog is still young. Still, his reaction tugged at my heart, making me realize that some day, he’ll come back to the book with sadder, wiser eyes. Tempus fugit, but especially, it seems, when you love a dog. On Tuesday, September 25, I’ll be signing BLUE at the fabulous Turn of the Corkscrew Bookstore from 7pm-9pm. And on Wednesday, September 26, I’ll be at the incredible Books of Wonder Children’s Bookstore in NYC from 6pm-8pm. BLUE has been selected by the Society of Illustrators Original Art show! Exhibit - November 7, 2018 to January 5, 2019. Opening Reception - Thursday, November 8, 2018. Featured Special Article about BLUE in Kirkus! I’m not the first person to say this, but it bears repeating: artist Laura Vaccaro Seeger is one of the most talented creators of concept books for young children, as well as an artist who uses die-cuts in some of the most unexpected and refreshing ways. Her best example of both of these things is Green, which won her a 2013 Caldecott Honor. Coming to shelves next month is a companion book, Blue. Green was a playful exploration of color (green, of course) and language, which took some abstract turns and delivered, to my mind, a subtle environmental message. (Seeger knows better than to preach at child readers.) At the book’s close, we saw a young boy positioning a green plant in the ground and then, on the next page, the boy as an adult next to a blooming, verdant tree: “forever green.” Readers came away from that book with a reminder that it’s up to us to keep our planet green, and Seeger made that point in a gentle, restrained, and hopeful way. Blue is a book that Seeger could have taken in any number of directions. It differs in that it has a narrative to share, a tender, emotionally compelling story, carried largely by the illustrations of a boy and his dog. But its structure and execution is similar to Green— we as readers take a look at various creative “shades” of blue, ones imbued with emotion and a sense of play, and Seeger’s thoughtfully-placed die cuts reveal surprises at each page turn. The book starts out with “baby blue,” and we see a toddler with a blue blanket — and a small, furry puppy sleeping next to the boy. As we turn each page, we see the boy grow, and we also see the bond deepen between the boy and the dog. Seeger attaches evocative descriptors to the blues we see — “ocean blue,” as the boy and dog play at the shore; “midnight blue” as they sleep in the dark on the boy’s bed; “quiet blue” as the boy reads to the dog, flashlight in hand, in a tent at night. Each one of these descriptors and shades of blue are connected to this emotional bond between the boy and his dog. It is within three quickly paced spreads — perhaps Seeger is trying to spare us prolonged heartbreak — that we see the elderly dog start to tire (“old blue”) and pass away. (Wisely, Seeger sets the tone for the loss, preceded as it is by “stormy blue” and “chilly blue.”) It is here, with the grown boy hugging his dog, that Seeger puts “true blue” to use. Do you have your tissues on hand? It is a poignant, deeply felt moment of emotional weight. Observant readers will follow throughout the book the presence of the boy’s blue blanket from toddlerhood. It becomes a kind of scarf that the dog eventually wears around his neck. When the boy as a young adult meets and falls in love with a woman with her own beloved dog, one that readers sense the grief-stricken man will welcome into his heart, he has this blue cloth tucked in his pocket. In fact, it is this bright shade of blue that is revealed via the die cut on the final page turn. His dog, though gone, will always be with him. Seeger puts little to no distance between us, as readers, and the action of this book. It’s as if we are right there with the dog and the boy. I love being able to see the canvas itself through her textured acrylic paints. It all adds up to an intimate book, a bittersweet meditation on love and loss that ends with hope and the promise of a healing heart. Don’t miss this one. Where this inventive author-illustrator explored both the palette and politics of the color green in Green (rev. 3/12), Blue finds her sneaking up on us with a story about loss, even if at first we think we are simply in for a celebration of all shades blue—“baby blue, “berry blue”—tucked into a portrait of the happy life of a boy and his dog. But as we explore blues both objective (“sky blue,” as the boy releases balloons into the air) and personal (“my blue,” where the boy and dog play tug-of-war with a towel), we slowly understand that the boy is growing, and so is the dog…“old blue.” As in Green, small die-cuts lead from each richly textured double-page spread to the next, always surprising, where the canopy of an umbrella becomes the top of a bird feeder, say, an encapsulation of the larger imaginative leaps being made from spread to spread. When was the last time a concept book made you cry? VERDICT: Though there is sorrow, it is followed by joy in this touching tribute to a heartwarming relationship that will engage readers of all ages. In this companion to her Caldecott Honor Book Green (2012), Seeger reflects on the many shades and emotions suggested by this pigment. “Baby blue” depicts a sleeping toddler and puppy sharing a blue blanket. A page turn reveals a slightly older preschooler and his dog collecting “berry blue” fruit. A child’s painting of a boy and dog, marred by paw prints, is captioned “maybe blue.” In later spreads, both youngster and pooch mature, sparking adventures that involve running into the waves (“ocean blue”), camping out (“quiet blue”), and a snowy walk (“chilly blue”). Eventually, of course, “old blue / true blue” passes away, leaving the teen “so blue,” until he meets a girl with her own pup, “new blue.” While story takes a prominent role in this concept book, Seeger has not neglected the artistic details that distinguished her work. The acrylic-on-canvas paintings exhibit a range of styles: from playful (“silly blue”) to contemplative (“midnight blue”) to gently combative (“my blue,” in which boy and mutt each tug at the baby blanket). As in Green, strategically placed die-cuts help to connect the spreads, previewing important features of the next illustration. A story full of heart, this works on many levels, assuring satisfying discoveries with repeated viewings. Fun times at ALA 2018!